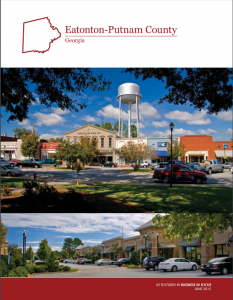 Results from a series of U.S. Department of Defense sponsored Middle Georgia planning workshops were recently released showing the region’s strengths and opportunities. Stakeholders from development authorities, school systems, Main Street organizations and other government officials from the region participated in asset mapping sessions last May and August. Then, Future iQ leaders, who conducted the charettes, prepared some suggestions for economic growth based on the ideas and concerns of participants. “The stakeholder network mapping process will provide the Middle Georgia region with a network map showing the patterns of collaboration and sources of information on economic diversification across the region,” said Houston County Development Authority Executive Director Angie Gheesling, an organizer of the events. The target region includes the 11 counties that make up the Middle Georgia Economic Alliance’s Region 6, including Baldwin, Bibb, Crawford, Houston, Jones, Monroe, Peach, Pulaski, Putnam, Twiggs and Wilkinson. According to the report summary, stakeholders recognize that water supply is an asset the region controls on its own that provides a distinctive value to the community’s economic development. That is particularly true for Putnam County, which is located between two lakes – Oconee and Sinclair. Middle Georgia has a large water resource from rivers and aquifers, particularly in relation to other regions in the State of Georgia. that water use in North America is forecast to substantially increase in the next decade, especially in agriculture, and that climate change and environmental priorities are limiting or constraining the availability of water in many regions of the U.S. That has led to a rise in hydroponic greenhouse agriculture and Middle Georgia has sole rights to the water supply— giving them water security. The source, distribution systems and infrastructure are in place, which means requiring only limited new capital investment and additional research, investigation and characterization of the water quality and availability. Future iQ representatives found that the region has key assets, including human knowledge, technical expertise, higher education research institutions, entrepreneurial support services and a friendly business climate. Areas of improvement are in respect to networks, including access to alternative financing and building a culture and climate to support risk taking. Primary areas of innovation in the region include adaptive maintenance and manufacturing, corrosion testing, medical devices, cyber security and logistics. The Middle Georgia region has a significant concentration of higher education institutions and an April 2017 Board of Regents of the University System of Georgia report estimated that 2.2 local jobs were generated by every job in those institutions. The summary notes that the Middle Georgia region, with seven universities and colleges and 25,000 students, has its future workforce and talent in the community. The asset mapping suggests these higher education institutions should be recognized as an economic driver and asset for new economic diversification. The asset mapping results show also that educational programs should be created to match the regional economy. The region has multiple organizations and institutions that have a history of software development. Some are emerging with a focus on cyber security. Cyber security software is expanding rapidly into many other industries including finance, insurance, healthcare, aerospace, defense and personal devices. Mercer University has seen increases in computer science majors, from 30 to 60, and computer engineers, from 40 to 50, in the past 10 years. The study found that manufacturing and sustainment is an emerging industrial capacity in Middle Georgia. “Adaptive manufacturing, 3D printing (additive manufacturing) capability, corrosion testing and reliability centered maintenance establish Middle Georgia as a center of excellence for adaptive manufacturing maintenance and sustainment,” the report states. Middle Georgia has been recognized as a national leader in providing veteran services and training. The reports advises that the Federal Government is facing on-going funding and performance challenges in respect to veteran affairs, and that veterans are a pool of talented and trained workforce in a constrained national labor market. The Middle Georgia region has a high concentration of military service personnel and veteran service institutions and programs available to provide for that workforce. Stakeholders recognized that Middle Georgia has a long and unique history in the field of arts and culture. Many famous musicians and artists are from the region, including Little Richard, Morgan Freeman, Otis Redding, Allman Brothers, Alice Walker, Joel Chandler Harris and Flannery O’Connor. In addition, the areas have numerous sites and buildings that are on the national historic register. In 2016, Georgia overtook California as the top location for the production of feature films, which included 17 of the top 100 grossing films. The State of Georgia’s dedication to providing tax incentives for film production netted the state a $9.5 billion economic impact in 2017. Future iQ leaders suggests the region build a relationship with the Atlanta film industry to introduce Middle Georgia as film location and to take advantage of tourism trends where there is growth in visiting and participating in events and festivals linked to popular movies. To balance out that asset, the summary suggests an organization of regional economic and tourism departments to craft a plan and tactics to capture the Georgia film production industry. The report found that there are a number of film companies in the state, the statewide environment is good, Georgia is “Film Ready” and the region has accommodations and equipment for film industry crews. The report also found that the region has a strong collection of healthcare assets with several hospitals, including Putnam General Hospital in Eatonton. The study states that high performing healthcare systems supported by substantial workforce development and resources, which can provide a difference in relation to relocation and a resident’s quality of life decisions. The healthcare sector continues to be the largest employer in the region with higher than regional average wages.